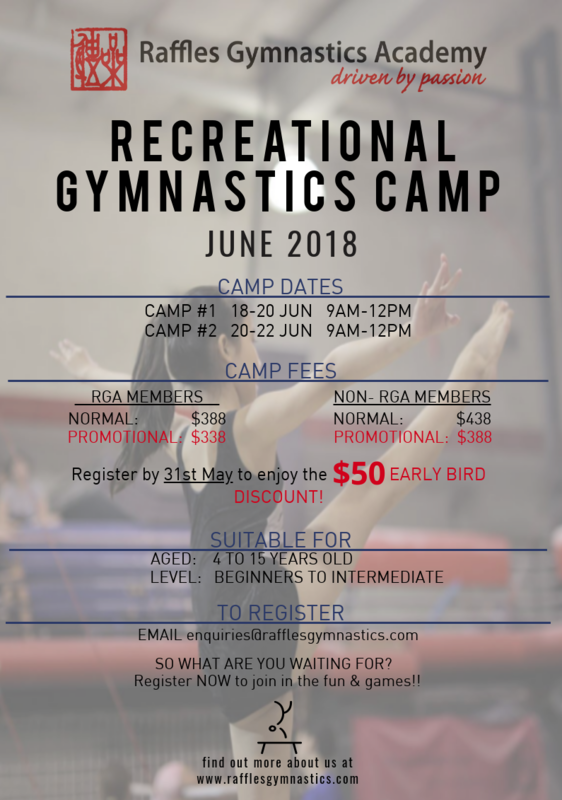 Welcome to Raffles Gymnastics Academy’s Recreational Gymnastics Summer Camp 2018! The 3-day camp runs from 9am – 12pm each day, and is suitable for boys and girls aged 4 and above. Activities include gymnastics, trampoline, rock wall climbing and lots of games! Healthy fruits and snacks would be provided too. Camp Attire: Leotards or T-Shirt and Shorts/Tights (no zippers, buckles or buttons). No jewellery. Raffles Gymnastics Academy reserves the right to change, modify or amend any fees, schedules and the Terms & conditions at any time without prior notice. In the event that minimum numbers for the camp are not met, classes may be cancelled, and full refunds will be made. We will hold a place for you at the camp upon registration, but please note that your spot in the camp is only guaranteed upon receipt of payment via cash or cheque. Slots will be given on a first come first serve basis.